Being a cat owner isn’t always easy….the early “wake up” meowing, the constant desire to try and trip you as you are walking, the fancy canned food that she turns her nose up at while refusing to eat dry food, the shedding, constant licking sounds as she insists on grooming next to you while you sleep or rest, and the worst part – the litter box. Now don’t get me wrong, I love my girl and I am a total cat person through and through, but if we are being honest I don’t think anyone “likes” cleaning a stinky litter box. 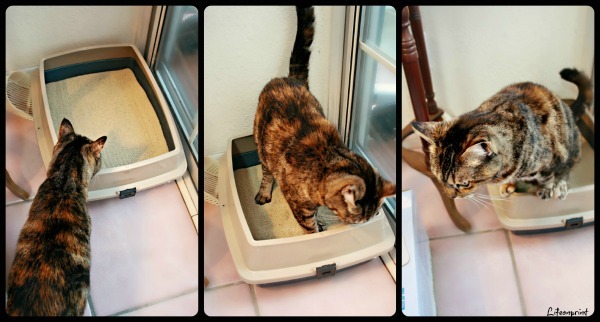 The poop actually isn’t the worst part of the litter box, that can be scooped and tossed immediately, it’s the ammonia smell from their urine that builds up in the box even after you think you have scooped it all out. Product received for review. I thought the litter I had been using was great, but it would get stinky really quick from the urine that would seep through to the bottom of the litter pan and I was finding that if I wanted the smell to be gone I would have to dump the litter to wash out the box. Tossing the litter every few days and washing the pan is costly, messy, and time consuming. So when I read about Fresh Air Cat Litter and how it weighs less, costs less, and lasts twice as long, all while eliminating odor and bacteria, I said “sign me up for some of that”, I had nothing to loose (except, hopefully the fuss and odor!). 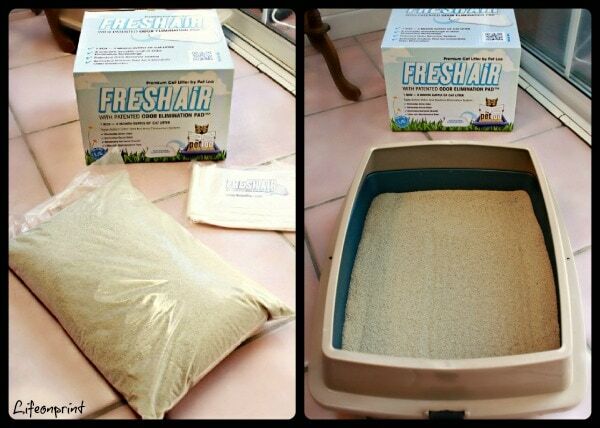 One – 2 month supply box of Fresh Air contains 1 – 14lb bag of litter and 2 Patented Odor Eliminating Pads. For my regular size pan I only needed to use 1 pad, but if you have an extra large pan you would use both pads. First I dumped the old litter and gave the pan a good washing. When it was dry I placed the pad shiny side down, then poured the whole bag of litter on top. I was hesitant to do this at first because I wasn’t used to using all the litter at once, but I wanted to test this properly, so in it all went. I made sure that the litter evenly covered the pad and I placed it in the corner and went to get The Lady to see what she thought. She took but a second to check it out and then got right to business! She totally approved. You see the other thing with her old litter…she didn’t really care for it, she would only use the box when she had to, when it was rain outside or when I wasn’t home to let her out. At first I thought she just preferred going outside all of the sudden, but I was wrong. Since we have had Fresh Air litter, she only uses her box. After she used it the first time I waited about 10 mins. to see if the urine would disappear or what…I had no idea what to expect. When I came back the wet spot was still there, but I did not smell anything, I took the scooper and raked the sand a bit and within minutes the wetness seemed to disappear or dry up, this was awesome! I had high hopes for this product, but I knew that time would be the true test. So I took note over the next couple of weeks of how the litter held up. It has been over a month now and fresh Air is living up to its promises! I only have to scoop when she poops, otherwise I just rake the sand around and the urine dries right up and her box is still as fresh as day one! When the urine is still wet I can smell it a little, but as soon as it dries, nothing. I am so excited about this litter!! My findings: Fresh Air cat litter lives up to it’s promise of a long lasting, odor controlling litter, that is easy to use and care for and is also cost and time effective! I give Fresh Air 5 stars. Be sure to watch the video on their site to learn more about Fresh Air litter. You can find PetLoo on Facebook, Twitter, and Pinterest too! I like that it lasts twice as long as other cat litter. WOW I would love to try this litter with my cats, I have 6 cats and the litter expense is getting out of hand!